Flexible E-Paper Finally Coming Out! 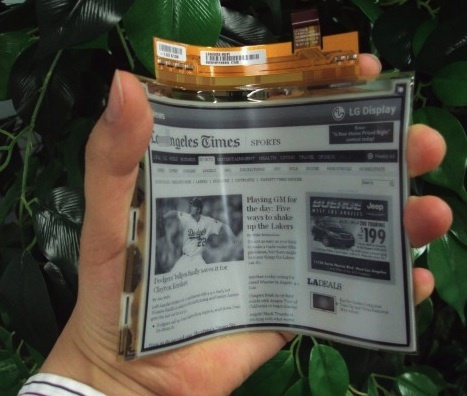 Flexible e-paper displays are finally going to hit the market! I'm so excited; I've been reporting on flexible e-paper displays for the last six years. LG's malleable plastic display sports a resolution of 1024 x 768 and can bend at an angle of up to 40 degrees. At just 0.7 millimeters thick, it's about one-third thinner than similarly-specced glass displays, and weighs in at 14 grams -- about half the weight of its glassy competition. Supposedly, these amazing displays will be coming out as products in a matter of months! Although these displays are small in size, they certainly meet the standards set by the e-paper newspapers from Spielberg's 2002 Minority Report movie and the mediatrons from Neal Stephenson's 1995 novel The Diamond Age. The flexible displays are black and white only, with 16 shades of gray; with video! Philips makes use of metal foil and plastic substrates; that's what gives the e-paper display its flexibility. LG Display arranged TFT on metal foil rather than glass substrate, allowing the e-paper display to recover its original shape after being bent. Just 150 microns thick; the 13.3 inch display weighs 20 grams.